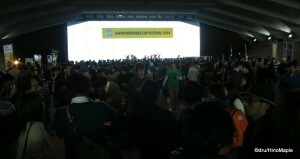 On the weekend of Jan 31 – Feb 2, Yokohama was host to the Japan Brewers Cup. It is a mix of competition and festival rolled into one. The weekend starts with the festival on Friday but the real competition started on Saturday. Most of the judging went on in the morning with the announcements for the top 3 of each type of beer being announced in the late afternoon. 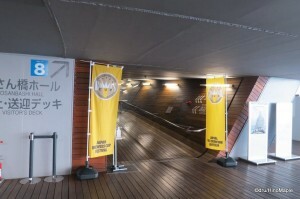 The event was held at the Osanbashi Hall in Yokohama. It is a really cool cruise ship terminal just across from the Red Brick Warehouses that are famous in Yokohama’s port side. It isn’t very convenient for me to go there but the prices were very reasonable and the atmosphere was a lot of fun. I plan to go back again next year if they have it. The first thing you need to do when attending the Japan Brewers Cup is to find your way there. I decided to go to JR Kannai Station and walk 15 minutes to the convention centre. It was not a long walk but it wasn’t a short walk. I was lucky that it was unseasonably warm so wearing a medium jacket was just right. Once you get to Kannai Station, just head towards the Yokohama Stadium and you’ll be going in the right direction. If you want to save a little time, or if it is convenient for you, you can take the Minato Mirai Line to Nihonodori Station which is just a few minutes from the convention centre. The convention centre is not very difficult to find but it isn’t so easy either. It has a distinctive architectural look. It is very flat and it has a green roof as well. You may even see a cruise ship or two as it is also a cruise ship terminal. I ended up going through the main concourse where you can buy ferry tickets rather than going through the roof where you end up at the main entrance. The Osanbashi Hall is located at the far end but the view was spectacular. When I arrived, I waited in line to pay the 500 yen admission fee and then proceeded to get the lay of the land. The hall itself is quite spacious but very much alive. The floors are very flexible and at both ends there are huge windows that allow a lot of natural light into the hall. It was a great setup and I can see why they chose this hall. The event is setup to be as spacious as possible. The central area has several garbage cans and lots of tables. The tables are setup to be more communal but there was a small problem of people hogging tables for a long time. It was not really nice when people hogged tables but after a few drinks you don’t really care. Both sides of the square hall were lined with booths. Each booth was selling something, and most of the time it was beer. Once you pay your admission fee, you are given a wristband and you proceed into the main area. On the right, they had all of the information you could want about craft beer in Japan. On the left they had more information as well but more suited to English speakers. As you moved in, on the right, there were a few food vendors with not so cheap food. It was your typical Octoberfest food with sausages and sauerkraut along with a few other items. I wasn’t really impressed by the food options. You can’t always expect too much when going to a festival but I hope they bring a bit more variety to the festival in the future. For a festival that is focusing more on American style beers, as many craft brewers do, it would be great if they had more American style food to help match the IPAs that I was drinking. The beer was the most important part of the festival. 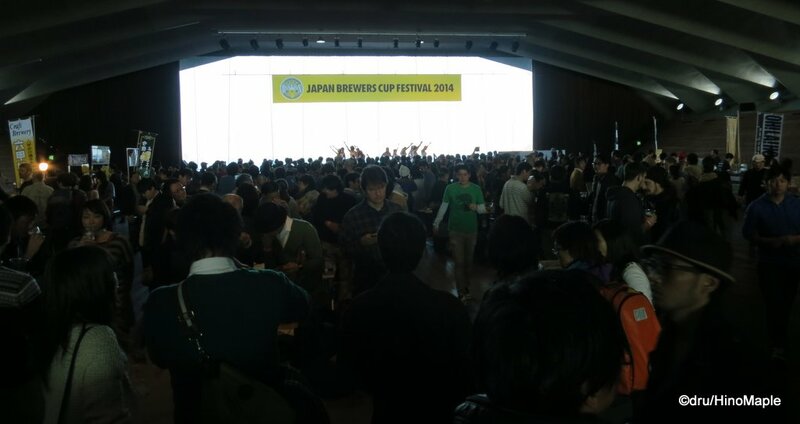 Unlike other beer festivals in Japan, this was probably the cheapest one I had seen, so I had to go. The entry fee was 500 yen and each cup of beer was about 500 yen; each cup was just under 500 mL but they had a variety of sizes. 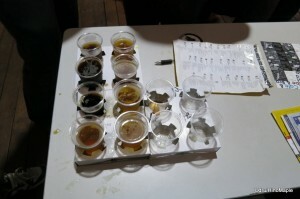 They also had a lot of samplers for 1000 yen where you get to choose 4 of your favourite beers from each brewer. Some brewers only had 4 choices so you didn’t have a choice beyond the 4 they offered and some had less choice so they didn’t have a sampler set. Due to the low prices and the large variety of vendors, it was easy to get a very good sample of the different beers around Japan. The focus should have been on Japanese brewers but they also had a lot of American brewers too. Many of them brought their employees to the competition and festival so you were able to meet some of the people from the breweries themselves. 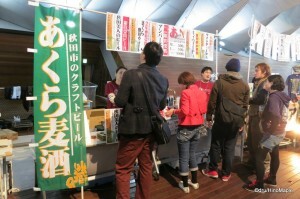 A lot of the craft brewers from Japan were also there. I was able to talk with a couple of them and even had a chance to talk with a new hop importer. I felt that the overall festival had 2 types of guests, those on business and those looking to have fun. The fun part of the festival was a lot of fun. People were having fun drinking and I was able to make a few new friends. Some people were there to hit on other people as alcohol and festivals are often a bad combination for these situations. I was a good boy and made friends with a guy who just got to Japan with the US Navy and is situated in Yokosuka. He heard about the festival from a friend but his friends couldn’t get “liberty” so he went alone. The festival itself also had a lot of entertainment. There was a kind of blues group named KOTARO & 櫻田武 that had really good music to go with the festival; a more formal R&B style singer with a DJ called SAYALA from 7$EVENSOUL; and a typical idol band called KNU. It was a real strange mix of music but they definitely played to each popular segment of beer drinkers. I did notice that a few of the people watching the idol group only showed up for their show and promptly left after the show was done. I don’t blame them as the stereotypical idol fan isn’t usually a beer fan. In total, there were 36 breweries represented at the beer festival. Most of them were from Japan but several were from America. Epic Brewing was the biggest name that I recognized but I also recognized a few breweries from around the Seattle area too. 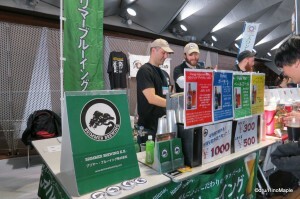 The Japanese brewers were also well represented with local brewers Brimmer, T.Y. Harbor, and Bay Brewing Yokohama. You also had a few major brewers such as Oh! La! Ho, Ya-ho, and Swan Lake Beer. You even had a few hard to find breweries such as Aqula and Rokko Beer. I don’t know if a 2015 Japan Brewers Cup will be held but if they do hold one, you can be sure that I’ll be there unless something happens. I hope that the festival will expand as it was a lot of fun and a great opportunity to try a lot of different beers. I may not recommend people to come to Japan just for this festival, but if you love beer and you happen to be in Tokyo or Yokohama at the same time, you can’t miss this great festival. This entry was posted in Festivals, Kanto and tagged 2014 Japan Brewers Cup, 7$EVENSOUL, Aqula Beer, Bay Brewing Yokohama, beer, Brewers Cup, Brimmer Brewing, craft beer, Epic Brewing, japan, Japan Brewers Cup, JBC, Ji-Biru, Jibiru, Kannai, Kannai Station, KNU, KOTARO, Minato-mirai, Nihonodori, Nihonodori Station, Oh! La! Ho, Osanbashi, Osanbashi Hall, Rokko Beer, SAYALA, Swan Lake Beer, T.Y. Harbor, Ya-ho Brewing, Yokohama, 櫻田武 by Dru. Bookmark the permalink.